The Historisches Museum Bern has an eclectic collection of local history and cultural objects from all over the world but is most famous for the Einstein Museum. 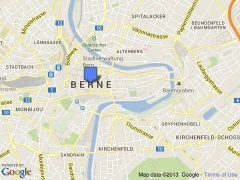 Bern’s large history museum has an eclectic collection of historical and cultural objects not only of Bernese history but also Asia, America, Egypt, and the rest of Europe. The Historisches Museum Bern is most famous for its large Einstein Museum – an extensive exhibition on the life and work of Albert Einstein, who lived and worked in Bern during the early-twentieth century. The museum also hosts large temporary exhibitions on a wide variety of themes. The museum is easy to enjoy and visitors can easily spend three hours here without seeing everything in detail. The Einstein Museum is probably the most popular part of the History Museum Bern, especially for foreign visitors. 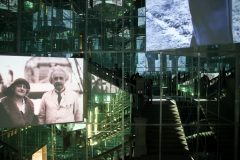 This large exhibition on the life of Albert Einstein (1879 to 1955) fills the entire second floor of the museum. Visitors either enter by elevator, or more spectacularly via a mirror-lined staircase with multimedia displays on Einstein. The Einstein Museum covers the full lifespan of Albert Einstein from his birth in Ulm, Germany to his death in Princeton, USA. The museum has many photos, original documents, and items used by Einstein. Many multimedia displays are used and the museum makes a valiant attempt to explain Einstein’s Special Theory of Relativity and General Theory of Relativity in four easy steps. See Visit the Einstein Museum in Bern for more details on this museum inside a museum. 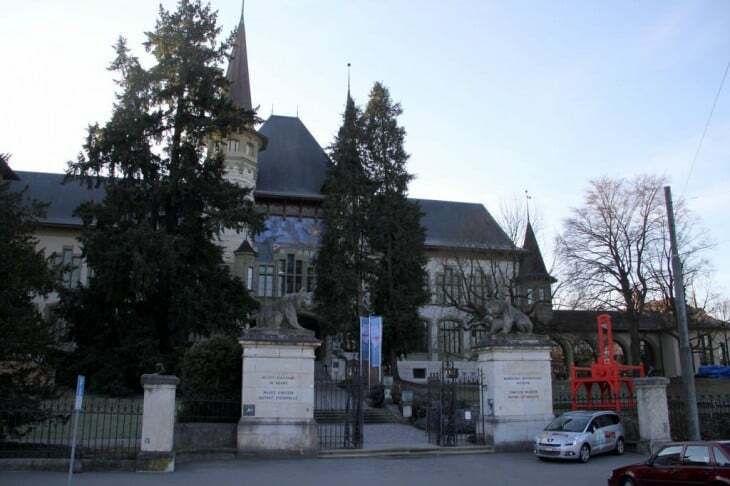 The main emphasis in the History Museum in Bern is the history and development of Canton Bern. As Bern has been the strongest political entity in Switzerland for centuries, many of the displays are in effect Swiss history. Chronologically, the exhibition starts on the ground floor with displays on the Stone Age, Celts, and Romans. Far more comprehensive is the coverage of the Early Middle Ages and Ancien Régime in the basement. This section deals with the expansion of Bern’s territory and influence through famous battles such as Grandson and Murten (Morat) in which the Swiss defeated the Burgundians. Children will enjoy the knights’ uniforms and weaponry. This section also has exhibits on public and private life with several preserved Stuben (smoke-free wood-paneled rooms that were heated from outside). The mezzanine floor has an exhibition on the end of the ancient régime in Bern, which followed shortly after the French revolution. Note the baby bear that was abandoned at Bern’s bear pits and stuffed by the French. Bern’s large silver treasure is also on display. Bern in the twentieth century is dealt with in an exhibition on the top floor – access is by elevator or from inside the Einstein Museum via spiral staircase, which is not particularly well marked. Go further up the spiral staircase to the belvedere with clear views of Bern’s old town and surrounding areas. Like many Swiss regional museums, the Historisches Museum Bern also has impressive collections of seemingly completely unrelated items from various parts of the world. 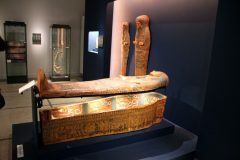 A small section deals with Egyptian antiquities and a collection of oriental art objects and swords. The museum also has a large collection of art works from Asia and Oceania. A further section has art and cultural objects from the American Indians. The museum’s large and important collection of Burgundian tapestries should reopen for the public from mid-2012. The museum hosts major temporary exhibitions, which are usually not included in the regular admission fees. The Historisches Museum Bern is open Tuesday to Sunday from 10 am to 5 pm. The museum is open on most public holidays. A separate fee for the Einstein Museum only is not available. Children pay CHF4 for the permanent collection and CHF8 for the Einstein Museum and temporary exhibitions. A family ticket (up to two adults and three children) is CHF40 for the Einstein Museum or temporary exhibitions. The validity of the Swiss Museum Pass depends on the temporary exhibitions. 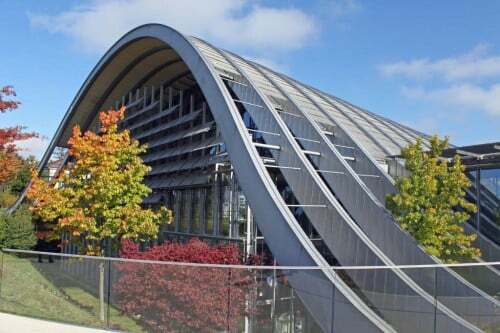 It usually gives free admission to the Permanent Collection and Einstein Museum but usually gives only 50% discount on admission to the temporary exhibitions. Some years, it gives no discount or free admission at all. Most of the descriptions in the History Museum are in German, English, and French. Audio guides are available in 9 languages. The Historisches Museum Bern is across the Aare River from the Swiss parliament. 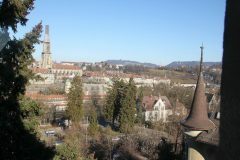 It is a simple stroll from the old town across the Kirchenfeldbrücke bridge. 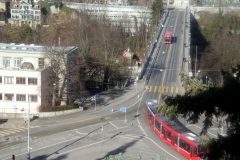 Many trams and buses also cross the bridge with the Helvetia stop right in front of the museum. From the Hauptbahnhof (main train station), trams 7 and 8 are the most convenient. 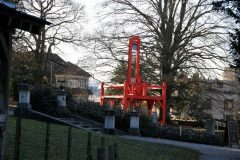 For travelers arriving by train in Bern, Swiss Railways often have special RailAway package deals that give discounts on transportation and museum entry. Street parking is available in the vicinity but during the week the time limits may be less than the time required to see the museum. The History Museum is in a lovely historicist building from the late nineteenth century with a modern glass cube annex. 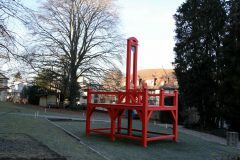 The pleasant gardens can be enjoyed for free and has a few large exhibits as well including historic bells that may be rung by visitors. The historicist building reminds of the similar building that houses the huge Swiss National Museum next to Zürich station.